Great lures for the Midwest Finesse style of fishing include (clockwise from top right) the Z-Man Finesse TRD, Z-Man 3-inch MinnowZ, Keitech 4-inch Swing Impact, and Z-Man Hula StickZ (shortened from 4 to about 3 inches). Ned Kehde poses with a largemouth caught with the Midwest Finesse techniques he has helped popularize. Midwest Finesse is a style of fishing that just plain catches lots of bass, which is why it’s gaining lots of fans. A big key to success is how you retrieve the little lures. While “finesse” techniques include drop-shotting, split-shot rigging and tossing smaller Texas-rigged worms, Midwest Finesse is more particular. 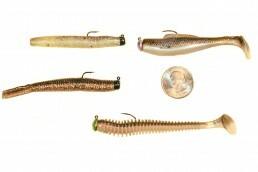 It uses open-hook jigs, primarily with plastic bodies, 2.5 to 4 inches long. It calls for little jigheads—1/32- to 1/10-ounce—with relatively small hooks (as small as No. 6 hooks on 1/32-ounce jigs) and small soft plastics. Hair and marabou jigs were common when the whole system started in the 1950s. 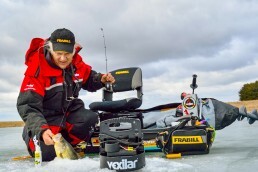 Ned Kehde, the 77-year-old namesake of the popular “Ned rig” is sort of the Jedi Master of Midwest Finesse. 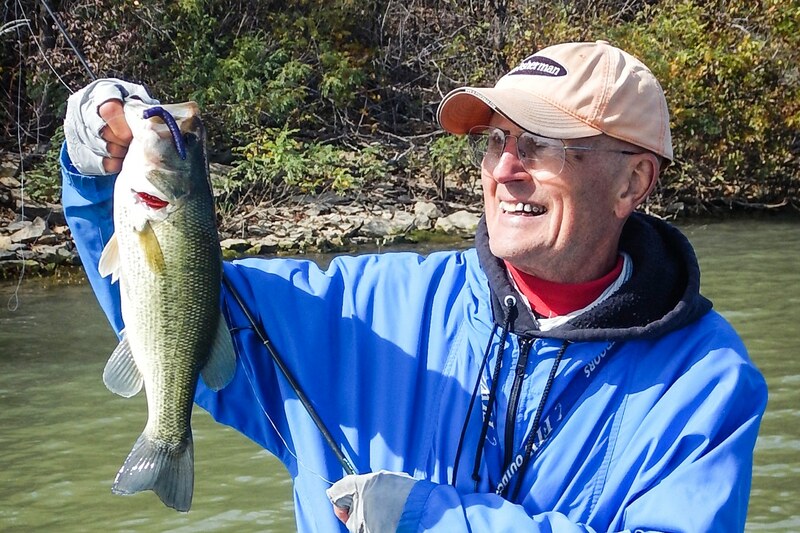 Kehde credits the late Chuck Woods, a Kansas City house painter and devout bass angler, with developing the technique. In its purest form, Midwest Finesse calls for short casts with these open-hook jigs in relatively shallow water (12 feet and less), employing one of six retrieves. When I fished with Kehde back in October of 2016, he demonstrated all six. Learn them, and you’ll almost always be able to catch bass (and other species) with at least one type of retrieve on every outing. The fish can show a distinct preference. Cast the lure and count it down until it hits bottom. That’s your bottom-detection cast. Now cast again, engage your reel and shake the lure as it sinks. Count it one less count and start slowly reeling before it hits bottom. Make it swim back towards you. Stop reeling and let the lure pendulum forward and glide towards bottom, but not touch. Shaking can happen during the swim or the glide, and isn’t always necessary. Kehde says if the fish are aggressively feeding, shaking often can help get more hits. To shake the lure, just wiggle your rod tip a bit. In this one, your reel handle creates the hops. After casting, point the rod tip downward, so it’s just above the water surface. Shake the rod to give the lure some action on its way to the bottom. Now, reel two times around so the lure comes up and shuttles forward—not too fast or too high. Stop reeling. Shake the rod tip as the lure falls, and repeat. The guy in the back of the boat casts directly at shore, engages his reel and lets the forward motion of the boat swing the lure around behind the boat. The “deadstick” happens when the angler peels some line off of his reel so the lure stays motionless on the bottom, moving again when the boat’s motion tightens the line. The technique can get a light jighead to the bottom in as much as 12 feet of water. This started with a curl-tail grub and still works with one. It’s a great way to cover large expanses of a flat with the wind pushing the boat (Ned often deploys a sea anchor to slow the boat’s progress in wind, which is pretty much a constant in Kansas). Ned says to take long casts and reel so the lure comes steadily back—much like the Charlie Brewer Slider technique discussed in the last issue. The late Charlie Brewer used straight-tail worms and imparted no extra action. Ned notes that Z-Man’s straight 4-inch Finesse WormZs or 4-inch Finesse ShadZs also work great with this retrieve. I’ve had good success with shortened Hula StickZs (trimmed to about 3 inches) and the 2.75-inch Finesse TRDs, basically a straight, short worm. 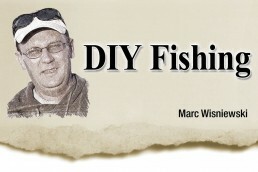 Ned notes that this can work best with a heavier jighead in deeper water. I caught my personal-best smallmouth, a 6-pound, 7-ounce Lake Erie beast down 15 feet on a 1/6-ounce head and Finesse TRD dragging and shaking. In shallower water, a 1/32-ounce head or a 1/20- or 1/15-ounce ShroomZ works best. Cast and let the lure hit bottom. Reel just fast enough to keep the lure moving but touching bottom. Give it an occasional twitch. Or just reel, as Charlie Brewer recommended. This is the “drag and deadstick” without the deadstick part. Ned showed me how to do it from the back of his 16-foot Alumacraft tiller boat. Basically you just cast off the corner of the boat’s transom at a 45-degree angle and let the boat’s motion swing your lure behind the boat. I believe the fact the lure doesn’t travel in a straight line as it swings has something to do with its effectiveness. Veteran weight-forward spinner and nightcrawler chuckers from Lake Erie will understand this. Many bites come as the lure swings. Strolling has been an effective technique with wind pushing my kayak across a big flat. This is Number 7 and isn’t one of Ned’s. 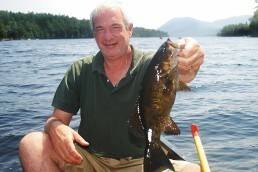 Greg Mangus, a truly great bass angler, taught me how to do it one November day years ago. Back then, Yamamoto Double Tail Hula Grubs were the real deal. Greg would hurl them downwind as a powerful breeze pushed his bass boat across a big flat. When the lure hit the water, Greg almost immediately started pulling it back with the rod tip. He’d move the rod tip towards the lure, putting some slack in the line, then pull back so the line would be moving. When the slack was gone, the lure would snap forward. The effect is snap forward, fall, snap forward. It’s definitely a good way to get a reaction strike from a fish whether you’re throwing those deadly Yamamoto grubs or any of the little Midwest Finesse lures. Want to join a cool bass fishing club? Drop a note to Ned Kehde at nkehde@ku.edu and ask to be put on the Finesse News Network email list. Ned, the reluctant namesake for the popular, diminutive Ned rig, distributes his own log as well as notes from fishing trips of other FNN members. You can also join in discussions on the Finesse News Network Facebook page. Many fishermen find that sort of description interesting.